While Apple's critics are scrambling to portray its restatement of guidance as some sort of evidence of a "lack of innovation" or "pricing that's too high," the reality is that it's simply evidence that President Trump's tariff war on China has hurt a key Apple market. Apple has never been better positioned-- and its competition is now performing so badly that any one of them would love to be in Apple's shoes. Unfortunately for Apple's competitors, they're no Apple. Today, the iPhone maker is grabbing virtually all of the world's profits even as the global economy inches toward a recession. Those who will be most severely devastated by global trade turmoil will be the low margin producers of Android commodity. Apple has a net $123 billion in cash to survive a downturn. That's not the case for Samsung, Pixel, Surface and the various low margin commodity phone producers in China who will need to demonstrate some potential for return in order to be able to continue to spend down their shareholders' cash reserves on hardware experiments. So far, every Android or Windows hardware maker-- including Google and Microsoft-- has demonstrated they are completely inept at making money in selling hardware even during an economic boom. It's not going to be easier in a recession! Apple has proven it can successfully make money no matter what conditions it is exposed to, meaning that it can invest its boom resources into building out of a global retraction. We know this is the case because it occurred a decade ago. Back in 2008, while the tech media was skewering Apple as being poorly positioned as a luxury-tier consumer product maker amid negative "global macroeconomic indicators," nobody seemed to notice that those hardest hit were actually Apple's former competitors: Motorola, Palm, Nokia, Blackberry and other firms that once sold tons of cheap phones; HP, Dell and other commodity PC makers; and Sony and other consumer electronics producers who suffered disaster once their low-margin, high-volume sales models were blindsided by a downturn in demand. Apple, however, continued to sell premium priced iPods and iPhones, and it continued to profit while its razor-thin margin competitors died off. It also continued to invest: in custom silicon, in new device form factors (creating the iPad), in new software and services (including the new App Store for iOS and liberal investment in annual new OS software updates). Apple emerged victorious and stronger. The only other phone maker that also survived was Samsung, which based its entire success upon copying Apple's brand and products so closely that it appeared to be budget, store brand equivalent. But that copycatting was fragile. Once Samsung started following its own muse, its smartphone business began to collapse and its efforts to match Apple's efforts in silicon, tablets, music, apps, Siri, Apple Pay, and other areas all piddled off into failure. Today Samsung's phone business is an anchor dragging down the performance of the rest of the company. 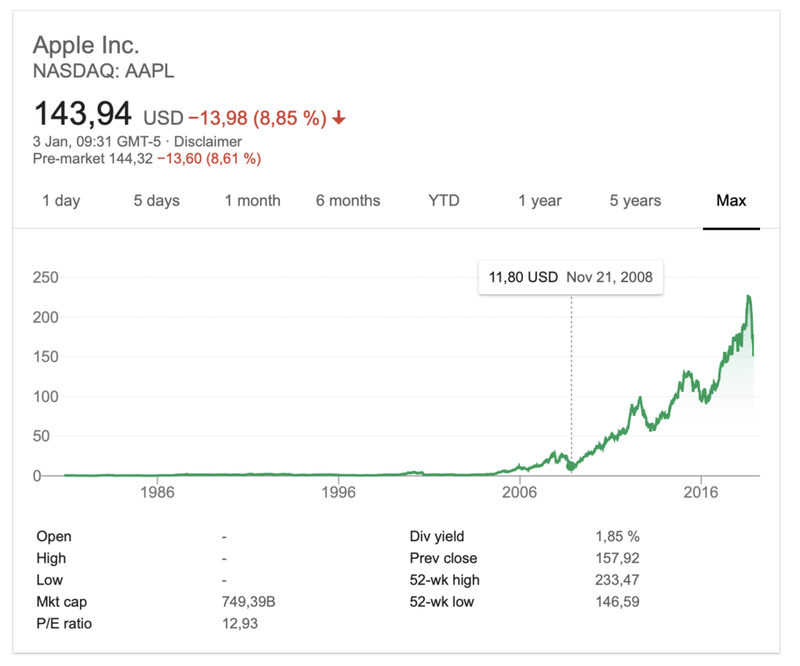 As you can see from the charting of Apple's share price, this panic repeated again at the end of 2012 (fears surrounding Apple's ability to "innovate") and again in 2014 (panic involving Apple's ability to sell phones in China). Today, the logic is that a 5-10 percent drop in expected revenues should crater Apple's stock by more than 30 percent when it already had the valuation of a company that would never grow in the future. That isn't reality, it's an opportunity. And recall that Apple has $71 billion already allocated to buying back its stock, now available at a massive discount thanks to incessantly incompetent (or manipulative) financial reporting. Trump's tariffs have erected a formidable wall for global trade. His administration has erected trade barriers, pulled the U.S. out of trade pacts, and has destroyed domestic industries that rely upon China as a customer. American soybean farmers appear to have lost their critical Chinese market entirely, with exports there now falling to zero. U.S. producers of finished products like cheese and prepared meat are also seeing their foreign markets dry up. Yet Apple, which depends upon China for nearly 20 percent of its iPhone sales, is reporting the slightest of impacts during a full-fledged tax-shooting war. Apple's restatement of guidance dropped its revenue outlook for the December quarter by 5.6 to 9.7 percent from the range it had provided earlier. Apple's global revenues are so large that even a drop of $5 to $9 billion is a still single digit percentage-- and will occur without significantly dinging Apple's profit margins. In fact, due to its inherent profitability from tight operational expertise and its strategic share buybacks, Apple noted that "we expect to report a new all-time record for Apple's earnings per share" despite the drop in forecasted revenues. That's a marked difference from other major smartphone producers, who have seen their revenues collapse as buyers shift downmarket to lower end models, erasing their profits entirely. Apple remains the top high-end seller in China (and globally), servicing the vast majority of demand for high-end smartphones and taking away virtually all of the profits earned industry-wide. Once profits collapse, it becomes nearly impossible to rebuild a business in a competitive market. Samsung's Galaxy IM Mobile segment has been wallowing in failure globally, pulling down the rest of its relatively successful businesses including Display Panels and other components. Rather than seeing a slight single-digit pullback in demand in China, Samsung has imploded from being the largest producer for the country to being an eighth place also ran, with scant hope of ever regaining territory from the new domestic low-end leaders. And while Huawei, Xiaomi and other domestic brands keep taking turns producing the largest number of phones in China, none are making any real money, making them one step away from being replaced by one of the five other brands that build phones without creating loyal users and without generating profits that can sustain them through a downturn. That commodity market is shrinking, while premium phones are being "driven by new iPhones," according to Counterpoint Research's Market Monitor. While iPhone revenues are taking a hit from the tariff-induced economic slowdown occurring in China, iPhone sales are still expanding Apple's installed base. In fact, Apple's note to investors stated that "our installed base of active devices hit a new all-time high-- growing by more than 100 million units in 12 months. There are more Apple devices being used than ever before, and it's a testament to the ongoing loyalty, satisfaction and engagement of our customers." And while a huge slice of Apple's business comes from iPhones-- the segment that is hurting from the economic tariff casualty in China-- the rest of Apple's sales are actually continuing to grow significantly. Services sold to the vast installed base of iPhone users, along with Macs, iPads, Wearables and other accessories are collectively up 19 percent over the previous year. All by itself, "Services generated over $10.8 billion in revenue during the quarter, growing to a new quarterly record in every geographic segment, and we are on track to achieve our goal of doubling the size of this business from 2016 to 2020," Apple stated. The company also noted that "Wearables grew by almost 50 percent year-over-year, as Apple Watch and AirPods were wildly popular among holiday shoppers; launches of MacBook Air and Mac mini powered the Mac to year-over-year revenue growth and the launch of the new iPad Pro drove iPad to year-over-year double-digit revenue growth." Samsung would love to be selling its old smartphone buyers Galaxy Gear watches, tablets, PCs, apps, and cloud subscriptions, but it simply isn't. Outside of Galaxy phones, Samsung's IM Mobile division (which offers a device portfolio very similar to Apple's) engages in little more than busywork, producing nominal volumes of products that it can't sell at a profit. When phone sales go down, its profits simply collapse and there's no peripheral growth to fall back on. It's the same for China's Android producers, which can't even make money selling vast numbers of phones. Outside of handsets, they're making virtually nothing on sales of various PCs, tablets, watches, other wearables, internet services, and other ventures. Xiaomi's entire premise of loss leader phone sales was supposedly positioned as a way to create a base of users to sell services to. But that never materialized. Now the company is stuck building commodity rice cookers and other basic appliances. The prospect of "Peak iPhone"-- the idea that Apple is running out of people to sell its signature iPhones to-- has been bandied about for years. At some point it was clear that the company would have to expand beyond just selling iPhones if it wanted to keep growing its revenues and profits. Apple is now taking virtually all of the industry's available profits-- largely by creating a new ultra-premium class of iPhones and effectively selling it to buyers. At this point, the options left include selling those users new products and services. And that's something that Apple has been excelling at doing even as its apparent competitors fall all over themselves in failure despite desperate efforts to copy the surface of what Apple is doing. The future of smartphones isn't just cheap commodity smartphones. Rather, it's moving voice and video communications, text messaging, music, apps, and other computing tasks into new form factors that are better in some ways than a hand-held, pocketable mobile device. Devices like iPad, which Apple turned into a roughly $20 billion per year business, or Apple Watch, which continues to grow rapidly despite the fact that smartwatches were nearly a nothing business just a few years ago. And rather than cannibalizing its iPhone business to deliver "the next thing," Apple has augmented its primary business with growth in tablets and wearables, creating a ecosystem that bridges across various form factors and stitches them all together with Continuity features. Apple is also innovating in immersive wireless audio with AirPods-- the perfect pairing with Apple Watch. It's also creating new reasons for people to desire and buy a conventional Mac notebook or desktop-- a technology platform dating back into the 1990s and even earlier, but kept fresh as a way to develop interactive digital content for today's mass market of mobile users on iPhones, iPads, Macs and other development targets. Apple isn't just excelling at marketing new and old hardware devices. It has created a massive market for selling apps and software as a subscription, taking a sustaining cut that has turned the App Store from a basic software listing to a rich catalog of curated titles. That's resulting in a massive market for iOS software that's generating billions of dollars in development that spans not just iPhone consumers but more importantly enterprise customers that are making a permanent investment in iOS development and hardware: IBM, Salesforce, SAP, Deloitte, Cisco, and many others. Apple's latest effort is working to adapt its vast portfolio of iOS software to also work on Macs starting this summer, expanding the usefulness of its conventional Mac platform and tying its iOS and macOS platforms closer together for users. Beyond hardware and software, Apple has also invested in custom silicon design, starting with mobile CPUs and branching into graphics, neural net machine learning logic, custom storage controllers, and advanced imaging processing-- all of which are radically expensive and difficult for competitors to keep up in. Google has invested vast sums into ISP silicon making its Pixel phone a great camera, but it can't match Apple's ISP in video capture, and isn't selling sufficient volumes of Pixel devices that can fund the next few generations of image silicon advances. Apple is selling cameras-- it's now the most popular-- and advanced-- camera vendor on the planet, a fact that few have even noticed. Qualcomm is still ahead of Apple in modem technology, but that advantage is increasingly worthless as consumers can't see any real difference between gigabit chips and 1.2 gigabit chips when the fastest mobile networks run at real-world speeds well below 100 megabits. Everywhere else, Qualcomm-- once comfortably positioned as a leader in mobile chips-- is now finding itself both more than a year behind Apple in CPU and graphics and imaging and machine learning, and also increasingly running out of component buyers of its premium chips for high-end phones on non-iOS platforms, simply because there is scant demand for high-end Androids. Huawei and other Android makers are now working to develop their own internal chips, but these are also significantly behind Apple's work in advancing the state of the art. And the primary reason is that Apple has been selling virtually all of the high-end devices that make money and create a demand for even faster chips in the future. Not just smartphones, but critically also high-end tablets-- a market Apple has effectively owned since it launched iPad a decade ago. Just a few years ago, the tech media was applauding Google's incredibly cheap $150 Nexus 7 tablet. Today, those tablets don't even run the newest Android (if they run at all), Google has now dropped out of the Android tablet business, and there's no money driving new generations of performant Android tablets because there's nobody interested in paying anything for them. Certainly not enterprise buyers-- who have been investing in iOS tablets while the tech media scribbled up their fascination with cheap Google netbooks being dumped on K12 schools, an economic miracle about as efficacious as handing everyone a cheap fish. Overall, the entire global tablet market is being led by Apple "unabated" as IDC was recently forced to observe. Apple's sales of tablets are growing as the overall tablet market continues to collapse. Where is Apple's innovation? Seriously Swisher? Despite Apple's broad and deep success that has only been diminished by a global assault on trade and a full-on tariff war between its two largest markets-- and an explicit explanation detailing exactly why Apple has restated its revenues forecast for the December quarter-- tech media writers still seem to be completely confused about what's going on. Apple's chief executive Tim Cook pinned lowered revenue expectations directly on slower demand for new iPhones in China, but Kara Swisher of Recode told CNBC that beyond that, she imagined that Apple's problem was also an "innovation problem." "The innovation cycle has slowed down at Apple," Swisher stated. "Where is their exciting new product and where are their exciting new entrepreneurs within that company?" Cook himself addressed this, noting that Apple is seeing significant growth across its products and services outside of iPhones. In fact, his note to investors explicitly stated that one of Apple's problems wasn't some media invention of a lack of consumer interest or lack of "innovative" hits, but rather Apple's inability to keep up with demand. Cook actually made the "exciting new product" that Swisher puzzled about a key point of his note to investors. "We knew we had an unprecedented number of new products to ramp during the quarter and predicted that supply constraints would gate our sales of certain products during Q1," he stated. "Again, this also played out broadly in line with our expectations. Sales of Apple Watch Series 4 and iPad Pro were constrained much or all of the quarter. AirPods and MacBook Air were also constrained." Apple just bought out a theater to spoon feed the tech media its latest innovations, including a watch that can perform an EKG and an all-new lineup of both iPad Pros and MacBook Airs. Three months ago! How often does Apple need to song and dance for these grumbling curmudgeons pretending to never be impressed? As a side note, Swisher said she was impressed by Amazon, without stating whether it was the innovative failure of Alexa to serve its stated goal as an inducement for online sales, the innovation of buying a grocery store, or perhaps Jeff Bezos' incredible innovations in bamboozlement such as charting data without any sort of actual measurements. Cook rather clearly stated that the cause of Apple's forecasted revenue decline was not a mystery that members of the media needed to interpret and expand upon, but that's certainly not going to stop them. "Lower than anticipated iPhone revenue, primarily in Greater China, accounts for all of our revenue shortfall to our guidance and for much more than our entire year-over-year revenue decline," Cook unequivocally stated [emphasis ours]. And while many would like to use Apple's revenue adjustment as a data point supporting their personal theory that prices are too high and consumers can't afford to buy them, Cook also clarified that, "We also expect to set all-time revenue records in several developed countries, including the United States, Canada, Germany, Italy, Spain, the Netherlands and Korea," as well as some emerging markets which "set records, including Mexico, Poland, Malaysia and Vietnam." Two research groups that estimate global PC shipments not only served up incorrect data as fact, but also used the bogus figures to reach entirely false conclusions about Apple's Macs in the global PC market. This isn't the first time they've been so wrong but outlines the lack of accuracy from third-party "sales estimates" as Apple prepares to stop reporting its official sales numbers altogether. Apple's largest supplier—and the primary source of the flexible OLED panels used in iPhone X and the new iPhone XS lineup—reported 24 percent year-over-year growth in its Q3 revenues from its semiconductors, memory, and display panel unit, an increase it attributed to "increasing demand for flexible [OLED] panels." That supplier was Samsung, and the "major customers" it credited clearly included the world's largest seller of high-end OLED phones. Why aren't Samsung's results attributed to being an "iPhone supplier"? Bloomberg is back with a story that presents Apple's trade-in program as being an example of desperate price slashing in response to supposedly flagging sales of what Apple has actually stated is its most popular phone —the iPhone XR. Apple's hardware designs, software, icons, marketing, retail strategy, and branding have all been closely copied by its rivals. One thing they aren't copying is Apple's vast, premium installed base of loyal buyers.